Most people know that diabetes affects the eyes, nerves, heart, kidney, and other major organ systems in the body. But, did you know that it causes oral problems too? 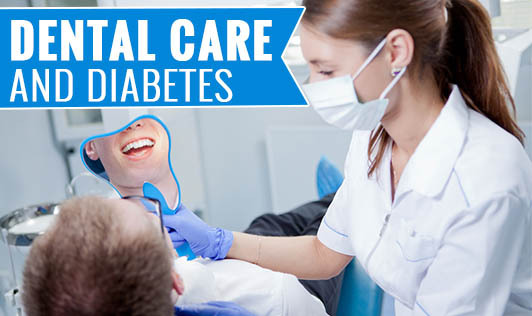 Irrespective of the type, diabetics are at a higher risk of cavities and gum diseases than non-diabetics. The higher the blood sugar levels, the higher the risk. Our mouth contains different types of bacteria. The reaction of these bacteria with sugar or starch present in food forms a sticky thin film called plaque attacking the outer layer of the teeth, leading to cavities. Diabetes reduces the ability to fight against bacteria and hence, extra care needs to be taken to maintain dental hygiene. Maintaining blood sugar level is a priority. Follow your doctor's advice and make suitable changes to your lifestyle if required. Brush your teeth twice a day without fail. Use an ultra-soft toothbrush and a toothpaste which contains fluoride. Avoid vigorous brushing as it can damage gums and the enamel of your teeth. Flossing your teeth everyday will help remove plaque in-between your teeth. Do not use tooth picks as it may damage or widen the space between your teeth; instead switch to interdental brushes. Visit your dentist once in 6 months for a professional cleaning. Your dentist should know you are diabetic. Make sure he does. Drink plenty of water and fluids to avoid keeping your mouth dry for a long time. Observe your gums and teeth regularly for early signs of dental problems like swelling and bleeding gums, cavities, redness of gums, and more, so that immediate treatment can be started. Make a sincere effort to manage diabetes and its related problems effectively. The effort would be rewarded with a lifetime of better health.